Below are the suggested best practices for setting up the Panopto integration within multiple 3Play Media projects. 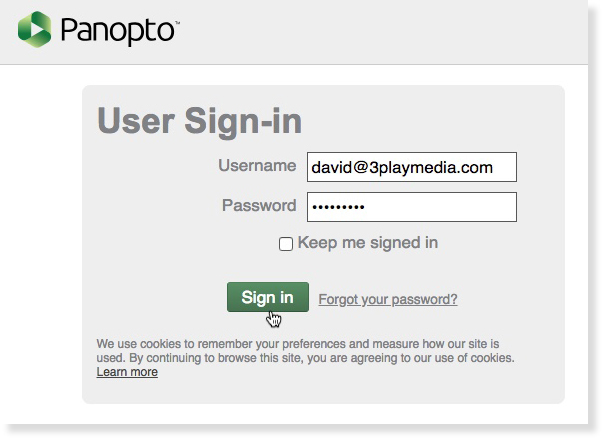 3Play Media users will want to adhere to these best practices when linking Panopto to multiple 3Play Media projects. XYZ University has a 3Play Media project set up for each department at the University within their 3Play Media account however every department shares one Panopto instance. The University wants to route requests from Panopto to specific 3Play projects for file management purposes. For example, XYZ University's Sociology department wants to submit their Panopto recordings to the Sociology department's 3Play Media project while XYZ University's Science department wants to submit their Panopto recordings as well but they want the requests sent to the Science department's 3Play project. In regards to billing, XYZ University wants to have one account-level invoice created each month for all of the work processed within all their projects. XYZ University has a 3Play Media project set up for each department at the University however they all share one Panopto instance. The University wants to route caption requests from Panopto to specific 3Play projects for file management purposes and have a separate invoice created for each project/University department. For example, XYZ University's Sociology department wants to upload their Panopto recordings to the Sociology department's 3Play Media project while XYZ University's Science department wants to send their Panopto recordings as well but they want the requests sent to the Science department's 3Play project. Additionally, in regards to billing, XYZ University needs separate project-level invoices created each month, one invoice for the Science department and another invoice created for the Sociology department. In order to adhere to the best practices for working with multiple linked Panopto account, you will need to have more than one 3Play Media project set up. Please note that when an account is created, the account is comprised of one project by default. If not all of the desired projects have yet been created, please contact your 3Play Media account manager as they will need to create any additional project for you and your teams. Projects can only be created by a 3Play Media staff member. Enabling Project-Level Billing can only be enabled by a 3Play Media staff member. Contact your 3Play Media account manager to activate Project-Level Billing. Sign into your 3Play Media account and switch to the 3Play Media project where you want to set up the linked Panopto account. Once within the desired 3Play Media project, click Upload Media > New Linked Account and click Panopto from the list of video platforms and lecture capture systems. Once Panopto is selected input a Nickname that corresponds to the 3Play Media Project's name. For example, if the integration is being set up in XYZ University's 3Play Media Sociology Project nickname the linked account Panopto - SOC. Once a nickname is added click Create Account. The API and Secret API Keys will display below the Nickname field. Keep this page with the API keys open and open a new tab in your web browser! Sign in to Panopto and navigate to System > Caption Services. Click New at the top of the Captions Services page. The Create Caption Services menu will display once New is clicked. 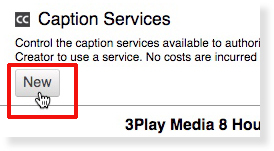 From the Provider and SLA dropdown menu select one of the 3Play Media turnaround time options. Once selected an Account Information section will appear with Username and Password fields. Add the name of the Department/Entity/User/Group that will be using this specific turnaround service level as well as something to identify the SLA type. In the Username field enter the API Key acquired in step 3. 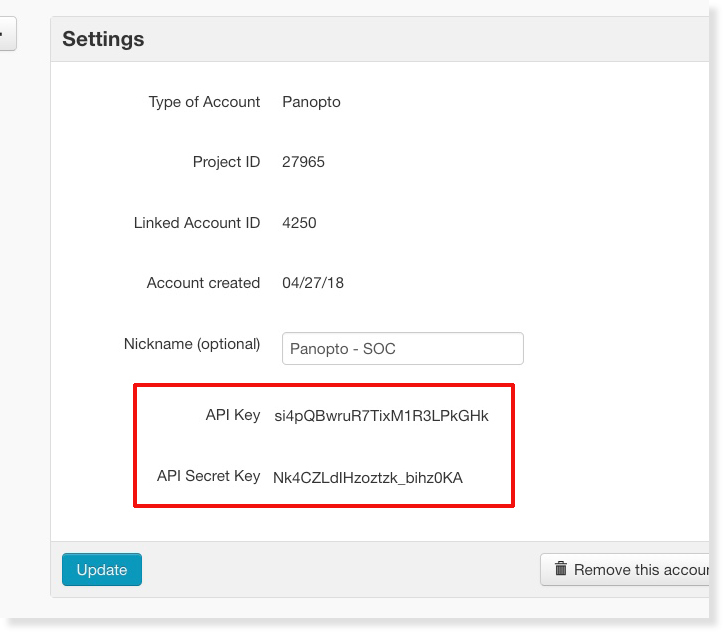 In the Password field enter the API Secret Key acquired in step 3. Allow any Creator to request this service level - please discuss this option with your team prior submitting caption requests from Panopto. 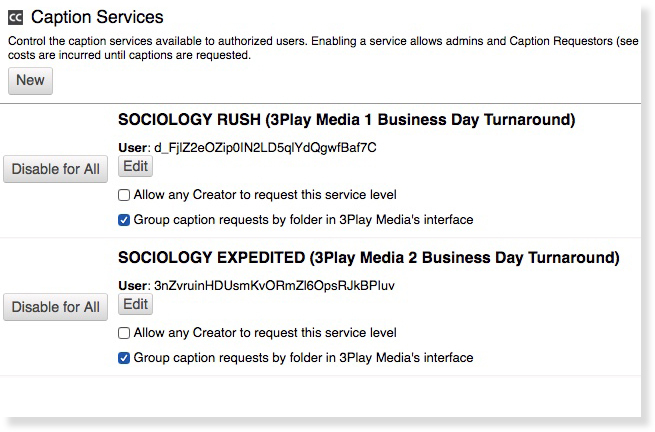 Group caption requests by folder in 3Play Media's interface -p lease discuss this option with your team prior submitting caption requests from Panopto. Click Submit to create this Caption Services option for your team. Repeat these instructions from step 5 using the same API Keys to create other Caption Service options for the same department/entity/group for any other desired turnaround service levels. Go back to the 3Play Media account system and switch to an other 3Play Media project where you want to set up the next linked Panopto account. 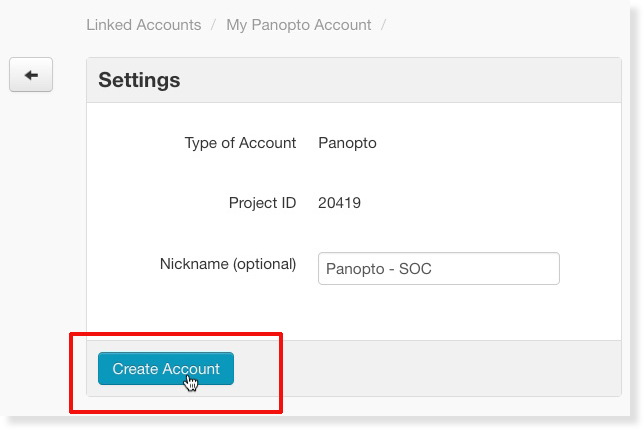 Once you have switched into a different project, one that doesn't have a Panopto linked account already created, repeat the processes from steps 2 & 3 however be sure to give a Nickname different from the first linked Panopto account's nickname. For example, if the integration is being set up in XYZ University's 3Play Media Science Project nickname the linked account Panopto - SCI. Once a new nickname is added click Create Account and a new set of API and Secret API Keys will display specific to this 3Play Media project. Keep this page with the API keys open and go back to the tab that has Panopto open! 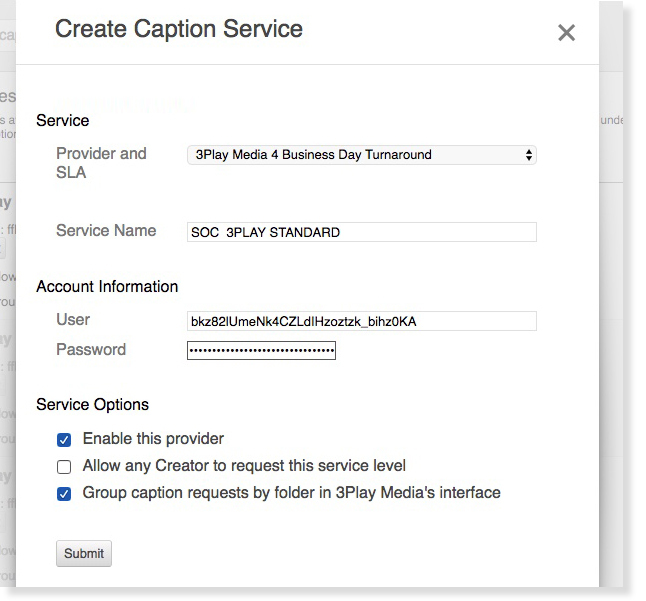 IMPORTANT: When creating new Caption Services for a different department/entity using a different set of API Keys make sure the Service Name given to this new set of caption services is different from the first set of caption services created. For example, SOCIOLOGY EXPEDITED and SOCIOLOGY RUSH were previously created for the Sociology department's recordings so for the Science department's caption services name them something like SCIENCE EXPEDITED and SCIENCE RUSH.